Lake front building lot with electric available! Have you ever dreamed of having a place on a private lake with few neighbors nearby, a place to drop in a canoe and spend a weekend fishing and relaxing with nothing but the sounds of nature to disturb you? Then this is a property you shouldn’t let slip by! There are 8 plus acres with 278 feet of frontage that border this perfect 37 acre non-motorboat lake. 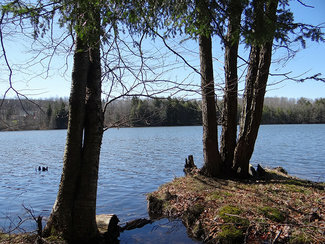 With a town maintained road, electricity available and easy access to the towns of Hamilton, Norwich and Cortland, this would make the ideal spot for a lake front cottage or log home. This kind of property comes along rarely, don’t miss out! Priced to sell at $69,900. Contact Matt Klink (315) 406-5470 for more information and to schedule a showing.